I’ve started to do some research into Airstreams. As a child of the space age, I find these silver pods fascinating – after all, an Airstream served as the quarantine space when astronauts returned from the moon. storage for fishing tackle, tack, firearms, etc. lounging around area (at the expense of elaborate sleeping quarters) – if I need more sleeping room, a small (13′) yurt pitched when needed may be the answer. I took my first look this past weekend – a 1975 27-footer. I have a lot of learning to do – what to look out for, what systems I’ll need to modify, etc., but a little learnin’ never hurt anyone. So, with this post I’ll inaugurate a new category on the blog – nomadics! This entry was posted in nomadics by dr.hypercube. Bookmark the permalink. The pictured Airstream reminds me of the ones that my parents would live in for six months of the year in the early 1970s (pulled by a Jeep Wagoneer). But seriously, the airstream has to be the coolest thing I’ve seen in a good long time. I’ll bring those suggestions to Liam tomorrow, since he’s out a web connection for a few days. But seriously, the Travelall seems to be the best bet, since the Power Wagon can’t do highways, the Unimog I’m guessing is a joke (unless you’re serious, in which case that’s a good option) and can the Caddy Eldo even carry the airstream? I mean, a minigun would be nice, but it won’t be much good if it’s stationary. Well, not AS good. I want one (with your mods, the yurt etc)! The first grouse hawkers on the plains were serious Airstreamers. I used to stay in Kent Carnie’s, which he offered me, but I didn’t have the (few) dollars at the time. Recently some have been going back to them. An issue that’s bothering me a bit: what do I do with all my books while I’m a nomad? Storage, I guess – though I have been toying with the notion of renting a small office – legal residence and all that. My parents had an Avion trailer in the 70s – similar shape and aluminum skin concept as the Airstream. It was a wonderful trailer. After the Iranian oil shock of 1979 and 80 when gasoline soared to maybe 60 cents a gallon, my father was determined to sell it. I was doing lots of archaeology fieldwork at the time and it would have been ideal for me to use. He refused to sell it to me, as he was utterly convinced that I would never be able to afford to pay for the gas needed to pull it. Never quite forgave him for that. My dad’s 1970 Jeep Wagoneer would probably not be the tow vehicle of choice today. It got only 14 mpg when not towing the trailer. But he did say that 4WD was a good thing to have when towing, and having low range was occasionally helpful for some maneuvers. In researching for an article about people who use their Airstreams as offices, or bases for work-related activity. If you get around to outfitting that dream Airstream for your falconing(? )let me know. I’m currently on the road for a year in ours, and know other families/individuals who full-time in theirs. Its a whole other culture. You liked the photos of the cobra lilies. Strange things they are. 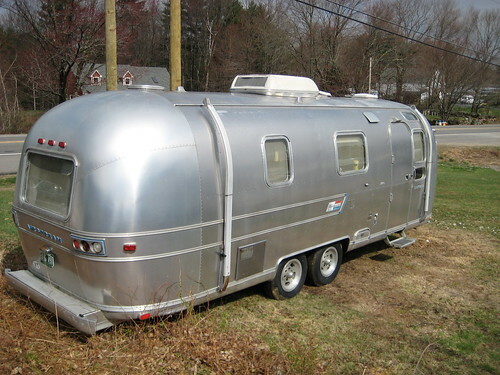 When you get around to outfitting a trailer for your work and it is an Airstream, please let me know–it would make a nice story for Airstream Life magazine. Having just been informed (this morning, in fact) that I am the proud inheritor of a 30′ Airstream and GMC Suburban tow vehicle (6.2 ltr diesel), I read your post with some interest, and look forward to seeing what modifications you make. I’ll keep checking back to see if you do, in fact, decide to go with the Ultravan rather than the Airstream. I’m guessing the Airstream would be less injurious to the pocketbook, since there were only 370 Ultravans produced, and those available are probably highly sought after. Good luck with your search! Aloha! I want one to and Airstream that is. Had a chance but missed out on that Beautiful Airstream. I actually got on this page trying to get some information on starting an Orchid Nano-viv. Saw Pictures of it and was very impressed with the very fine Moss on Terra-cotta cylinder. I would sure like go grow Moss like that or where I can get it. By the way when an Airstream pass me on the Highway I always say “Oh! Look there goes my Airstream. I can dream can’t I? Recent proud purchaser of a 29′ 1970 International. Have not had it on road yet but it appears to be 90+% original. Can hardly wait till spring to try the maiden voyage, Champagne and all. Great to see this site. I am in San Antonio, Texas, on the northern fringes of South Texas. Saludes to all. Congrats! Send along some pix of the maiden voyage.